Not all my couples come on a cruise, and not all come in a group. 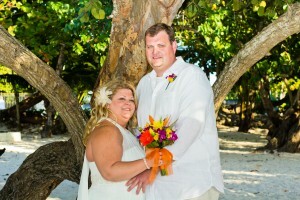 This couple, from Arkansas travelled to Grand Cayman as a couple, and stayed at the Reef Resort in East End. As I do with many of my couples staying at Cayman Kai, Rum Point or East End (the Reef or Morritts) I offer them the use of my Bride's Room to get dressed. This was the last Bride to get dressed in the Bride's Room at our old office. At the beginning of this week we moved into our beautiful new office right on the water in George Town, and within easy walking distance from the cruise landing. We are located in the One Cayman House building between Burger King and Cayman Helicopters. If you are travelling as a couple and you take the all-inclusive package, the two adult witnesses to your nuptials are included. Some couples want to be married in the early afternoon so they can get the deep blues and turquoise of the water at this pretty spot. Others just want the sunset. 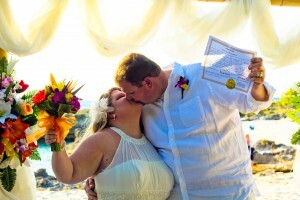 This couple got married at 4:30 pm and were fortunate enough to get a bit of both. This is the 6" cake, it serves 6-8 people. You can also take it to the restaurant where you're having your wedding dinner and have it served for dessert. 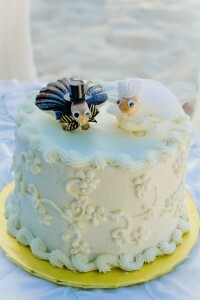 You can't beat wedding cake and champagne on the beach. I will lead you through the Champagne Cork ceremony and the Cutting of the Cake. This couple completed their special day by dining at the Lighthouse Club in Breakers. 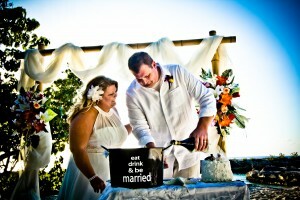 Please see my page Simply Weddings Recommends for other recommendations for hotels, dining and other activities.